In marriage relationships, differences of opinions are going to come up all the time. In fact, if you have no differences then it may be argued that you aren’t spending enough time together. According to couples researcher John Gottman, couples face two kind of issues. Yes, that is right you can put your differences into one of two categories. The first kinds of problems couples face are the solvable kind. These are the easy things in life like who is going to make dinner or who will drop the kids off at school or who will mow the yard. So within a few minutes of discussion you can come to a conclusion and find a mutually agreeable solution to the problem. Now, the same problems for some couples might be easily solvable but for others these kinds of problems might not be so easily solvable. This brings us to a second kind of problem. These problems are known as perpetual problems. These problems have no easy solution. Every time one of you attempts to bring these issues up, you end up hitting brick walls. Eventually you begin to feel isolated, distant and lonely if too many of these issues start to pile up. Perpetual problems might be centered around how much time you devote to one another versus alone or with friends. It might center around your sexual desires including type of things you might like to try. It could involve parenting styles and types of disciplines. These perpetual problems tend to not get solved because person views them as a “right or wrong” proposition. In other words rather than trying to work through the issues, each of you become more and more entrenched thinking your partner is so skewed and wrong in his or her thinking. Differences in personality. One example could involve a difference in extroversion versus introversion. In this case one of you might prefer to stay at home most of the time and one of you might like to go out more. Differences in upbringing and differences in your childhood experiences. If you were disciplined heavily and your every move was scrutinized, then you will almost assuredly have the view that your children should be parented in this way. Conversely if you were given more slack, you will tend to do the same as you parent. Differences in world view. This can often stem from how you were brought up as children but can also be developed as you get older as well. Probably the easiest explanation for this would center on political views. If one of you is more heavily left leaning on the political spectrum and one of you leans heavily right, then you will almost certainly disagree on much in this area. You might be extremely surprised to know that Gottman says that around 70% of all issues that couples face are those that are perpetual. Only 30% are solvable. So what are we to do? Give up? No, I will give you three things to do regarding perpetual issues. Slow Down. 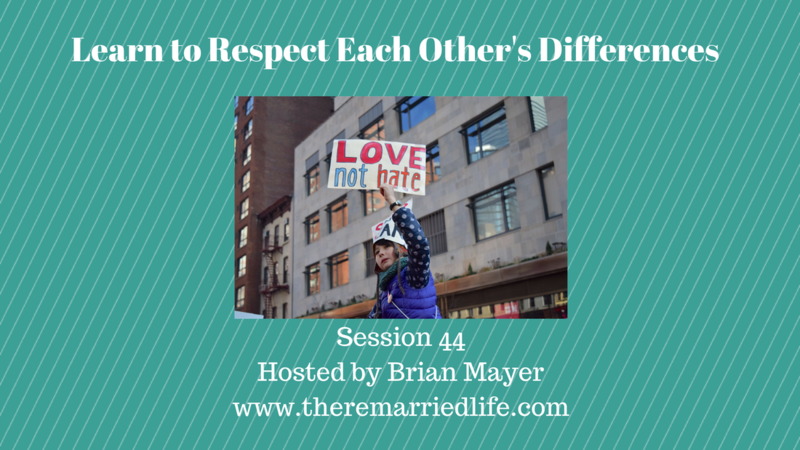 Sometimes we are too quick to get emotionally in a disagreement with our spouse. Take some time to really listen to what your partner is saying. Ask yourself and feel free to ask your partner where this opinion comes from or why it is so important to them. Finding the answers to these questions can sometimes lead to realize that something that holds a significant meaning for your partner can help change your perspective. Agree to Disagree. This one sometimes trips people up and they think that each must walk away mad. If you can have conversations with each other about the fact that you will often disagree, then knowing this option is available can help. Now of course you may still need to work some solution out but being respectful about it can be a big help. Compromise. Uncover areas where you are not willing to compromise and share those. Also uncover areas where you can compromise. See if those areas where you can bend some will be just enough to solve the issue. Think about the problem as the problem. Your spouse is not the issue, the issue is. So if you can shift your perspective and it is really effective if both of you can shift your perspective, then this can sometimes bring a solution to the surface. ​Just remember you cannot avoid issues in your marriage. That is not the goal. If that were the goal then I would tell to live like roommates in separate rooms with separate bank accounts with separate lives. So don’t get yourself down if your are bumping into each other on many issues. Think about what we talked about today including the ways in which you can work with perpetual issues in your relationship. I hope you have enjoyed today’s message. ​As always remember that marriage is nothing something you have, it is something you do. Talk to you next week unless you are binge listening in the future in which case I will talk to you in about a minute! Take care.